Bryant is one of five members on the Clyde River History Committee that also includes Sandra Cameron, Hilda Colodey, Nancy FitzGerald and Carol Murray of Cornwall, who are presently or formerly from Clyde River. 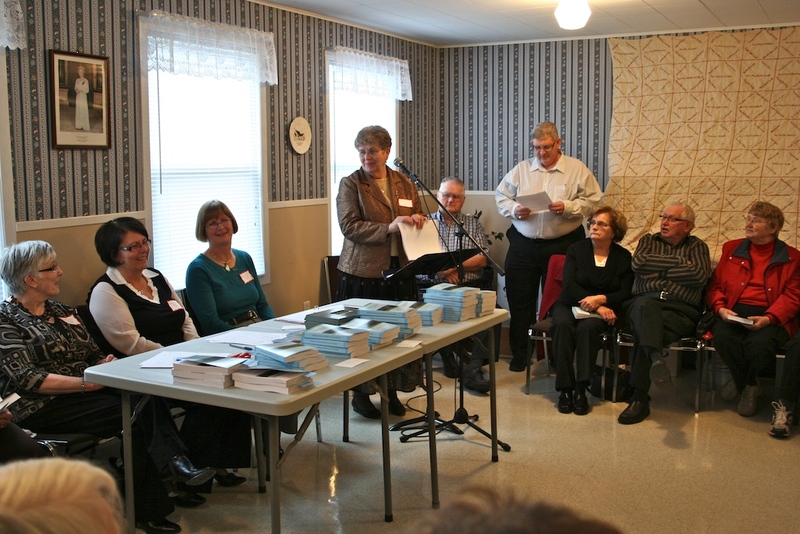 The committee produced the new book, which was printed by Kwik Kopy in Charlottetown. Fortunately for the history committee, much work had already been done in terms of collecting invaluable local information and stories before they started this project a few years ago. One invaluable resource was a series of scrapbooks carefully complied over years by four local women and a diary kept by an early female resident of the area. In 1991, Neila and Warren MacKinnon taped interviews with local seniors, including veterans from the Second World War. These proved to be an amazing resource for direct-from-the-source quotes from people who have since died. “They interviewed people who are no longer here . . . so we had access to their insights,” says Bryant. Richard also conducted interviews with past and present residents of the community. “We (also) had this great Tea to Remember event where we brought them all together, the seniors of the community,” FitzGerald says of this fun event which resulted in a wealth of memories and historical information. The committee then divided up the sections and spent the whole winter writing. Another student with the Heritage Canada program, Erica Ross, came onboard in the summer of 2009 and assisted the history committee in putting it all together in a publishable package. The book details the origins of Lot 31 and the challenging beginnings the original settlers had to contend with when they arrived from Scotland in the early 1800s. “The names we have used in the founding families are the ones that came between 1806 and 1848,” Bryant says. Cameron explains that the list is a collective of 15 surnames, including Darrach, Hyde, Murray, MacPhail, Livingstone and more. Letters were then sent out to a representative of each of those families, if any were available, asking them to prepare a short history of their lineage for inclusion in the book. By 1881, there were more than 250 families in the area. Businesses popped up as need dictated, including a store, post office, a number of mills, a blacksmith shop, a tavern and a doctor’s office, as well as two churches and a school. The book committee also included some local lore that captures the imagination. “I should explain that we called it ‘history and stories’ because some of the stories may not be of historical value but they make the book very interesting,” Bryant says. They also delved into the social life of the area — the way things were before the modern technology. These insights of the simple joys of Christmas concerts, playing ball and being a teenager in Clyde River came from the shared memories from the 1991 interviews and from many of the seniors who attended the Tea to Remember event in 2008. This history book takes readers right up to the here and now in Clyde River, but history is always in the making. “I guess we were thinking of future generations (during the creation of this book),?but it was an exercise for ourselves, too, to validate where we are in the community and how it has changed, but it’s certainly surviving and evolving,” Colodey says. Books can be purchased for $20.